Google is getting pretty serious about helping people find the food they want. It has updated search on mobile once again, this time to show you recipe options when you search for food. The feature has yet to come to desktop. Looking for something yummy to cook for dinner? 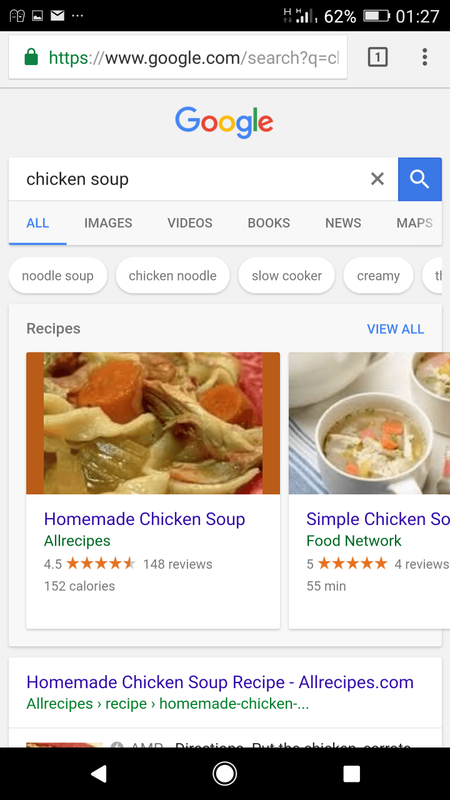 Google wants to help — in fact, Google’s mobile search results will now show you recipe suggestions when you’re searching for food. Google has made good use of its “knowledge graph” in the past few years, helping users find better results for their searches straight from search itself. In this case, you’ll see a carousel of cards at the top of the display with recipe suggestions, and when you click on those cards, you’ll be taken to the recipe itself. Google is even giving you a few extra filters for those recipe results — under the search bar, you’ll get more suggestions that you can use to refine your search. For example, when we searched for “chicken soup,” there were links to “noodle soup” “chicken noodle,” and so on. You’ll also get a “view all” link, which will take you to a more detailed view of the recipes Google is suggesting. All in all, Google is getting pretty serious about helping people find the food they want. Add the recipes to the huge list of local restaurants Google already serves up to users, and you’ll get a huge selection of food choices. Unfortunately, the recipes are currently only available on mobile, at least in our experience. It’s likely you’ll eventually be able to access recipes from desktop computers, but Google’s focus is squarely on mobile, so mobile platforms get features like this first. Next Next post: Top 10 Android Apps of 2016!